While taking into account some of the most popular social media, the number is sure to perplex people. 2 billion monthly users are countered on Facebook, whereas, Twitter holds 328 million users and Instagram counts 700 million worldwide users. Don't you think, the social media app development has changed the overall scenario "how people used to interact". Yes, of course, the time is advancing and so as the practise, social media apps are doing wonder in the recent scenario. Considering business perspective, the niche of social media showcases a promising market, and so as the social media app development company. Although, this segment witnesses the dominant players, also the rise of advanced technology, constantly doors in the opportunities that can be realized into new ideas. We understand how critical role a social media app play! Well, let's see what are the parameters to look upon while creating a social media app. A mobile application is a prerequisite for the successful project, therefore a clear understanding is very important. The very first step should be identifying the target community, i.e who is the audience. The process of identification needs to be done in the brainstorming stage. Social network platform can be created for the specified requirement of the population. For this identify the preferences and what are the kinds of stuff that require being shorted out. This will develop a better understanding and provide you with a clearer idea of what you can do to lure their attention. Sometimes, your offering may seem unique in the market. The gathered demographics and psychographics data make it simple to create the related solutions for the requirement. The features and functions are tightly related to the quality of the identifies. The core requirement of the target audience outline the features of developing a social network website. Have a close look at what do you want your users to do? And how will you define the privacy of the data? Identify the features and what are the required functions of the social media network in order to determine the platform. The biggest challenge at this stage choosing the right method, that will be effective and efficient for the respective social media network. Well, technology evaluation requires being done by professionals. For this, hire a consultant to save time and avail great solution. However, by preparing a list of relevant questions, apply different CMS such as Ning, Drupal, Ruby on Rails, or.Net and find out which technology framework is really beneficial and worth for the app. Once the user-specific features are listed, it helps in structuring the overall app. There are few basic rules that can be applied to building all web pages. And it is important to attract users through social activity, making them stay for long hours. The three important element of social media structuring apps is Customer service, Security, and stability. Fouse must be given in this direction to bridge the shortcomings. Let's understand, what is activity stream? Today, the activity streams are the core of every social media website. When the Facebook launched this feature first, it managed to set the standards on the market, as the concept went far beyond the mainstream the expectation. When we talk about social media, it’s important to understand what audience wants, so a great concern is required to develop quality activity stream, any failure in doing so can spoil the true essence of the social media network. For instance; Using Drupal activity stream module ensures high-end features, it’s easy to customize network. Status updates are crucial and require regular updates. Well, choosing the right open-source microblogging platforms helps in developing quality status update features. There are many platforms available for the same, for instance; Laconi.ca or Identi.ca are ideal options. Further, using content management system like Joomla, easily make the content type that has a limited number of characters. Once you have defined the target audience, try exploring the related features relevant to the users' requirement. And of course, this will lead to attracting the right users. There are a lot of tools that will help to create awareness on the market. For instance; the sensational social media app “Facebook”, created for college youth quickly succeed to stole the social media industry. Today, its been used in almost every industry to connect potential clients in a very well-efficient manner. Success is inevitable, but only if everything is planned in a proper manner. With unique feature and the striking idea, it becomes easy to attract users, and this can even change the overall social media trend. 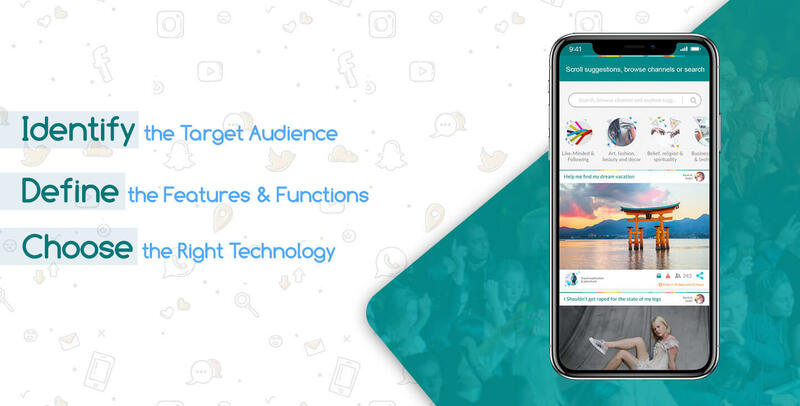 Further, in order to build the best social media app, focus on the core values of your social media platform and follow the guideline suggested above. Choosing the right social media app development company, allows having a technically brilliant development professionals in order to design the exact social networking needs that is perfectly blended with innovative feature and advanced trend.